Charlotte has been confounding us for the past month or so. As I reported in June and early July, Charlotte was eating beautifuly earlier this summer. She ate willingly, chewed nicely, and was beginning to eat like a regular kid. Or, at least the way we assum a regular kid eats. Then, sometimes in mid-July, she slowed down, started fighting us again, and seemed to backsliding. At the same time, she came down with what turned out to be the first in a series of three back-to-back ear infections. The first and last ear infections were double. Last week’s final hurrah crescendoed with one ear bursting, unbeknownst to me, and a nearly sleepless night. On Friday Charlotte had her first “sick day” from school. Though she didn’t have much fever, the ear infection and sleepless night knocked her out. 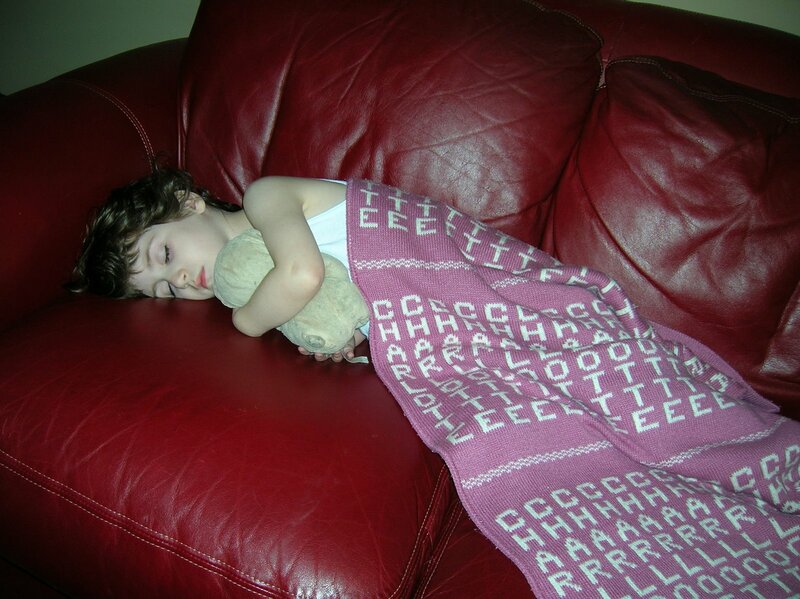 The picture above was taken at around 10:00 a.m. Little honey–she climbed up on the couch to rest and cuddle. I walked away to answer the phone and when I came back she was sound asleep. I had to wake her up to take her to the doctor. Through it all she was sweet and cuddly, patient and kind. This last dose of antibiotics seems to have knocked the demon ear infections far away. How do I know she’s finally cured? She simply can’t get enough to eat!!!! Including her hot lunch at school…. Categories: ear infection, eating | Permalink. Earaches are the worst for little ones. I’m glad the medicine is working.Hate to see such a happy girl laid low. I’m sorry Charlotte got sick, is she better now?